Are you ready to improve your current living situation rather than move to another neighborhood? Or, have you thought about taking the home you have loved to the next level and make it your dream home for today? You’re not alone with this thinking. But many homeowners don’t move forward since they believe that financing and lack of cash is a roadblock for them. We’re here to show you several options (four in fact!) that can help you make that renovation come true. Remember to always meet with a financial advisor and perhaps also a tax advisor before you pursue anything. There are pros and cons that you need to fully understand based on your specific financial situation. 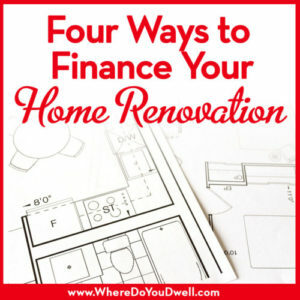 Before we get into the details of HOW to finance your renovation, we want to caution you on one very important piece of the puzzle — deciding what you want to spend on your renovation. Please be cautious not to over-improve your home for the neighborhood or spend your renovation dollars on details that won’t provide “return on investment” when you resell. Not sure what that really means? Always feel free to call us so we can review what you are thinking about doing for your renovation. Just because you spend the money on “improvements” to your home doesn’t mean you are guaranteed to get it back when you sell. We can help you make sure that doesn’t happen with your renovation, whether it’s a big or a small one. By keeping us in the loop, you can avoid overspending for your neighborhood and putting your finances at risk when you’re ready to move on to your next home. A home equity loan with a second mortgage allows you to take a loan that’s based on your home’s equity plus other factors such as your income. Remember, the equity in your home is basically the difference in the home’s current market value and the balance left on your mortgage. Pro: Once approved, you get an upfront lump sum and must repay a certain amount each month subject to a fixed interest rate. It will be a fixed monthly payment, just like a first mortgage. The length of the loan is shorter than first mortgages, usually five to fifteen years. This second mortgage can be a great way to tap into your equity and use it to improve your home’s value. It’s a viable option for those of you who have a low interest rate on their first mortgage and don’t want to do a cash-out refinance on that first mortgage (see #4 below). The interest is tax deductible, but check with your tax advisor, of course. The third pro to this option is that if your current interest rate is low, then you can keep that mortgage if rates have increased. This new second mortgage would be a completely separate mortgage than your current one. Con: Typically that second loan’s interest rate is slightly higher than the market interest rates available. You’ve also now added an additional monthly mortgage payment. If you can’t pay back the loan, you risk losing your home. Also, you must pay back the loan in full when you move or you’ll need to get a new loan to pay back this loan. With a “line of credit,” you are approved for a certain credit limit based on your home’s equity, just like the second mortgage option explained above. The difference is that this loan functions almost like a credit card — you can withdraw money when you need it over the lifetime of the loan, such as 10 years. You can take out money and pay back money. Your payments change based on how much of a loan you’ve taken out as well as what the interest rate is that month. Pro: You only pay interest on the amount you withdraw and not on the total amount approved. Interest rates are usually lower than credit cards, and payments are tax deductible. This is a great option for folks who are going to be able to pay off the line of credit with an upcoming bonus or sale of another home. A second pro of this option, just like the second mortgage, is that you can leave your current mortgage alone at a low interest rate. No need to mess with a good thing, this HELOC would be an additional loan and seen as short term because of the variable rates. This is a great option if you can pay off the amount you borrow pretty quickly either through selling another property, an upcoming increase in income or an upcoming bonus. Con: Credit lines have variable interest rates rather than fixed rates so your repayments can change depending on the interest rate at the time you withdraw money. You should carefully review all requirements, fees, penalties and how often the interest rate is adjusted since HELOCs can vary depending on the lender. If you don’t have much equity in your home, you can consider a renovation loan. The lender bases the loan on what your home will be worth once the renovation is complete. For this loan, you refinance your current home and add on the amount needed for the renovation to the same loan. So it’s one large loan, not a second mortgage. This loan requires that you work with a contractor and architect and not do any DIY work. Rather than getting a lump sum directly to you, the lender is the one who pays the contractor as the work is done. Pro: You don’t need equity in your home now because the loan is based on the value of the home once the renovation is complete. Monthly payments on these loans are typically lower than credit cards or personal loans. And the interest is tax deductible. Con: Your mortgage balance will increase since you are refinancing with a larger amount. The lender has more say over the timeline and process of the renovation. This money is only used for a renovation with a contractor, who the bank pays directly. This financing is similar to a renovation financing, but lenders base the loan on what the home is worth now, not when the renovation is completed. So you’ll need equity in your home. For this loan, your original mortgage loan is paid off and the amount needed for the renovation is rolled over into the new mortgage total. This can be a good option if interest rates have gone down recently. You’ll be able to take advantage of lowering your interest rate while at the same time tapping into the equity of your home for the renovation. It’s like a “two-for-one special” of the loan world. Just make sure interest rates are lower than your original loan. If not, it may make more financial sense to do one of the other options. Pro: The amount needed for the renovation is given directly to you in one cash payment rather than having the lender pay the contractor. You have more flexibility with this financing. Con: Keep an eye out for interest rates so you don’t get a higher one than you have now. As long as you can choose a financing option that works well for you in both the short and long-term AND you are able to devote the time, energy and displacement that living through a renovation entails, this is a great way to stay put in a home or neighborhood you don’t want to give up. And that’s a great thing as homeowner since it means you made a great decision when you decide to buy this home!